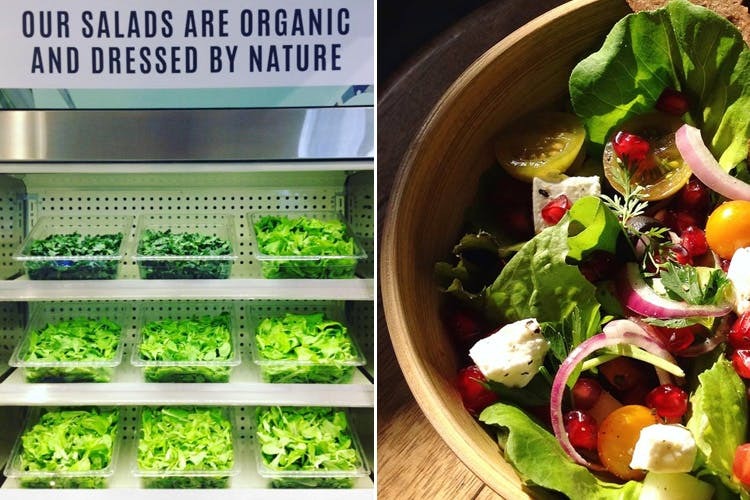 Kitchen Garden by Suzette has introduced a ‘Grab and Go Fridge’ stocked with proteins, cold pressed juices, desserts, salads and sandwiches. In order to cater to the people with a busy schedule, Kitchen Garden has introduced a ‘Grab and Go Fridge’. They offer protein pots, salads, granola, yogurts, juices, soups, cold chocolate and latte as well as chocolate mousse and seasonal desserts. Plus they keep replenishing the fridge with fresh stock and nothing is left overnight. There is a 50% discount on the ‘Grab and Go Fridge’ section from 10:30pm-11pm. We really love the Chocolate Granola and Buckwheat Pancakes from their breakfast option. Their salads are sandwiches are great too and you have the option of customising them according to your palate. That’s always a plus, isn’t it? Their breads are baked fresh too and the sourdough bread is heavenly. Pair a soup with a sandwich or go for the small pot option, and it’ll be a meal to remember. This is a place you can visit if you’re on a diet, without even feeling a pang of guilt. The team truly believes in encouraging a healthy, natural and organic way of living. Kitchen Garden not only gives a choice to eat healthier, more flavourful food but also becomes a one-stop shop for eating well, daily, with options of freshly prepared meals available for those on the go too. It is something that you’d really not want to miss out on.